Are you interested in architecture? Do you see, feel and enjoy its harmony? Is your heart thrilled with delight when you hear the names of Kazakov, Lvov and Rossi? If the answer is yes, then take a four-hour train ride to Torzhok, a small town in the Tver oblast. As soon as you arrive you will realize how strongly it attracts and lures you. You keep pressing your camera button and no matter which way you turn, understandable, dear and loved Russian landscapes surround you. Only the posts carrying electric cables remind you that this is the 21st century. If you try, you can easily find a secluded spot on a street where there aren’t any such intrusions. 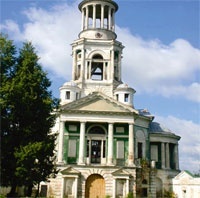 Torzhok is a marvelous example of an artistically complete architectural ensemble in the classical style. That’s why the town is considered to be a model of Russian architectural art of the 18-19th centuries. The most amazing thing is that Torzhok has preserved its architecture almost untouched. 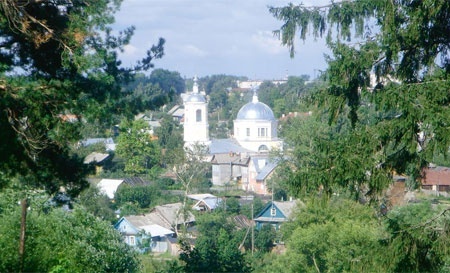 “Torzhok undoubtedly is one of the most beautiful towns in Tver province. 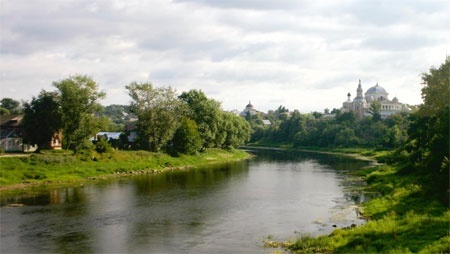 The banks of the beautiful Tvertsa river are fine and diverse. The ancient town is located on eight hills. Its streets and squares open a delightful panorama in front of you. And there are quite a few architectural and historic monuments around you that witness both sad and joyful events gone by.” That’s what A. Ostrovsky, a great Russian playwright, wrote in his diary about the place. I can only share his opinion and testify to its truth. Looking at the majestic Savior’s Transfiguration Cathedral, the cozy churches, the Road Palace, Kamenny and Petrovsky bridges, you feel stunned and perplexed. Finding all this splendor and grandeur in an off-the-beaten-track provincial town like Torzhok is surprising. Over 30 churches, cathedrals and monasteries have been preserved here. Services take pace in some of them; some are closed and their interiors dilapidated. Be that as it may, Torzhok is more fortunate than many other Russian towns. Few churches were destroyed here during the Soviet times. The Ascension church deserves special attention as a paragon of wooden architecture. It is difficult to find examples of this kind of construction which are not museums. Talking about Torzhok’s architecture, you cannot help mentioning the name of N. Lvov (1751-1803), to a great extent the creator of the town’s inimitable look. He was a man of many talents: not only a great architect, whose buildings are scattered all over Tver oblast and other parts of Russia, but also a civil engineer, a choreographer, a historian, a musician and a botanist. On the bank of the Tvertsa river, Lvov built an elegant Rotunda, the form he preferred above all others. Now the Rotunda houses a souvenir shop and is the gem of the town. There is a monument to Lvov right next to it. 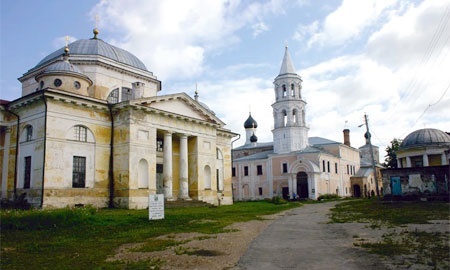 The ancient Boris and Gleb monastery, founded in 1038 and redesigned in Neoclassical style by Lvov, was home to a whole series of events in the history of Torzhok. The name of the town was first mentioned in Russian chronicles in 1015. 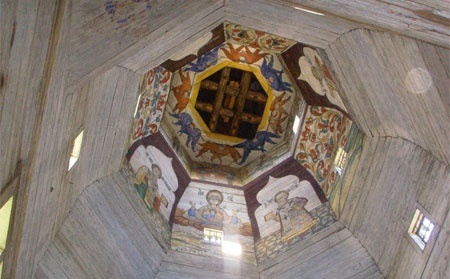 Torzhok was conveniently located at a commercial crossroad connecting the lands of Novgorod, Vladimir and Suzdal. It frequently changed hands during medieval times. In the 18th century, a land road, the so-called ‘sovereign’s way’ between Moscow and St. Petersburg, was laid through Torzhok. But even now there is no direct railway here, though Torzhok lies half way between the two capitals. The legend is that local merchants who had become wealthy transporting their goods by river bribed the right people and the railroad was built some distance from the town. Torzhok was well-known in Russia 100 years ago as an important industrial and commercial centre. Already in ancient times, the town was a centre of gold embroidery in Russia. Some historians have asked the question: what is older, the town or the craft? Excavations on the spot of the former Kremlin have determined that embroidery with gold threads was practised here even before the Mongol invasion. Embroidery was used by tsars, boyars and senior clergy for decorating their clothes, as objects of interior design and for cult purposes. Many boyars’ wives at court had their own workshops, but seamstresses from Torzhok had always been trendsetters. Here is a well-known fact: in order to embroider the porphyra (a purple gown of a monarch) for his coronation ceremony, Alexander II commanded that 30 of the best needlewomen from Torzhok be brought to St. Petersburg. The golden age of the craft occurred in the 18-19th centuries. A gold embroidery factory still works in the town. It was there that they made beautiful costumes used in such movies as War and Peace and Anna Karenina. Now they embroider clothes, military banners, Russian coats-of-arms, church shrouds, glasses, cosmetic cases and other objects. Many outstanding personalities of the past visited Torzhok, among them Tolstoy, Gogol and others. The great Alexander Pushkin, on his way to his village, stayed here more than 20 times. Even if Torzhok had not been known for its architecture and gold embroidery, this fact would have been enough to make it famous. There is a very nice museum of the poet in the town. On one of his visits, Pushkin bought some embroidered belts and sent them as a gift to a lady-friend in Moscow. He then asked her whether she wore the belts and whether Moscow’s women of fashion were envious. Pushkin stayed in Pozharsky’s inn. Its fame started with one of his letters. The beginning of the letter was written in prose, but the part describing Torzhok was nothing but wonderful poetry. Pushkin wrote about the inn and highly praised the cutlets that he ate there. During the 19th century, they were enormously popular all over Russia and even abroad. To be in Torzhok and not to try Pozharsky cutlets is impossible. I tried them. They were tasty but that’s all that I can say. Unfortunately the original recipe was lost.